I will be the first person to admit that sometimes when it comes to money and personal finances, I am a bit clueless. Especially in my younger years when I was just starting out and looking at all of the enticing credit card offers. However, I was also very lucky that my mom used to be a vice president at a bank and that she has a solid background in money management. If not for her, then I’m sure I would have made more than a few common financial mistakes. I’m incredibly fortunate that I do not have a large amount of debt to work off because I could have very easily fallen into that trap. 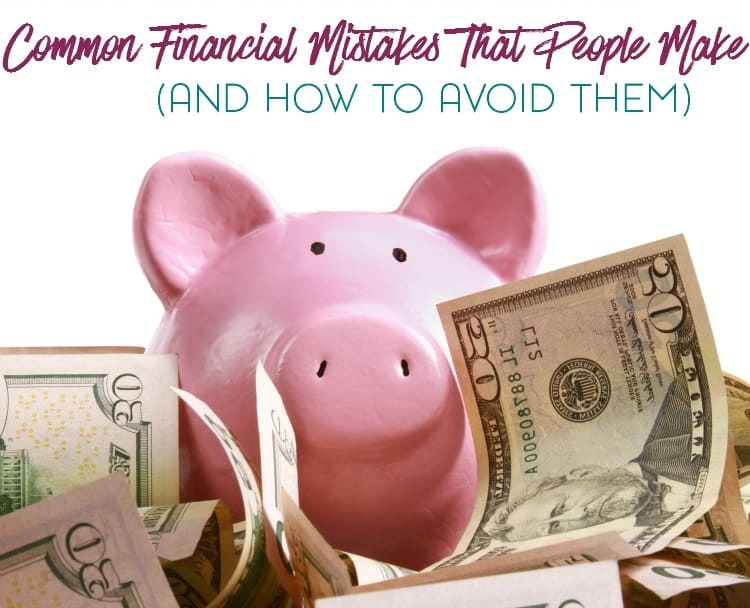 But what are these common financial mistakes that people make? We live in a day and age where it’s easy to find information on financial mistakes and how to avoid them. And yet, people are still making these mistakes! Whether it’s GenX or GenY related or individuals in their 30s; seemingly every demographic is affected. For example, getting into debt is still an overwhelming issue and likely always will be. Fortunately, it’s becoming easier to get out of debt and by taking actionable steps, you can easily get out of debt yourself. But it goes beyond that. So what are these financial mistakes? Mistake #1: Using that little plastic card to get what you want. We’ll just start off with the number one mistake out there. This is probably the most common mistake in the country. Almost every person in the US today has a credit card. It is almost like a right of passage when you turn eighteen. There are even people out there that aren’t eighteen yet that have them. Credit card debt is the fastest way to ruin your finances. It is easy to acquire and difficult to pay off. The minimum balance doesn’t pay off enough of your outstanding balance to help you very much. You will be paying on your balances for decades. Even a $500 balance can take you over a decade to pay off if you simply make the minimum payment. Add in the interest rate, which rarely goes down. If you miss a payment, you will really be paying the bank. Thirty percent interest is common on a credit card once a payment has been missed. And you only have to miss that payment by a day — which can happen in the mail or processing if you don’t plan ahead well enough. Mistake #2: Buying more home than you can afford. With the real estate market in the state it is today, many people are regretting their housing decisions. Adjustable rate mortgages are acceptable loan products for some people. But only if they can afford the maximum rate that the loan can hit if interest rates go up. Too many people only consider that introductory rate. They stretch and purchase as much as they can afford. Then, when rates go up and their rate adjusts, they can’t afford the payment. Add that to a slowing housing market, and you may have a foreclosure on your hands. If you are going to buy a home, make sure that you purchase what you can afford. Take out a fixed-rate mortgage so that you know what your payments will be. If rates go drastically down in the next couple of years, you can always refinance. If rates go up, you are protected. Try to aim for a 15-year mortgage over a 30-year. It will save you hundreds of thousands in interest. But if you can’t do it, a 30-year fixed-rate mortgage is an acceptable loan choice for the purchase of a home. Mistake #3: Not controlling your money. Too many people live paycheck to paycheck. They have no savings. They have no retirement plan. They have nothing to back them up in the case of an emergency. They have no control over their money. You have to take control of your finances if you want to retire someday. You have to learn how to budget, save, invest and spend. All it takes is a little time. And once you get in the habit, you will notice that your life has more control. You should say where your money goes, not lenders or creditors or anyone else. Mistake #4: Not saving for retirement. There are more seniors in the work place now than there were twenty years ago. And even more than there were fifty years ago. If you want to retire with enough money to live comfortably, you have to start putting something back today. Start an IRA. Contribute to your employer’s 401(k) plan. Figure out how much you need to invest and find a way to do it. This is your future. You don’t want to reach sixty and realize that you can’t afford to stop working. There is no guarantee that you will be able to draw social security or other forms of assistance then. What if you become ill and have to retire? What if you get hurt? Prepare for the future. Start saving for retirement today. So how can you avoid these financial mistakes? #1 Eliminate emotional spending: Before you head off to the mall, take a minute to note what you are feeling. In a recent study by moneycentral.msn.com, people who had just watched a sad movie clip were willing to spend more than those who had just watched other types of movies. #2 Pay off credit card debt as soon as possible: Take a long look at how much you are paying to borrow money from your creditors. Think about consolidating debt with a single loan that has a lower interest rate that’s fixed. #3 Start planning for retirement now: If you are not saving money for retirement, you should be. A recent study in USA Today showed that currently, 53 percent of people in the workforce have no pension and 32 percent have nothing set aside for retirement. If you’re planning on relying just on Social Security, you probably should think again. The current average payout is just $955, or $11,460 annually-and could be even less, depending on your work history. You should consider working with a financial professional and completing a personalized financial profile. This can help determine how much you need to start saving in order to reach your financial goals, such as retirement, education savings for your children and other goals. #4 Prepare for the unexpected: Don’t use the “it could never happen to me” excuse when dealing with something as critical as your family’s financial future. Sudden accidents or unexpected critical health problems happen every day to those who least expect it. Once you are aware of what the common financial mistakes are, it might be easier to avoid them all together. But that doesn’t mean that you’re completely immune, either. Great post Kori! So simple, but so many great points. Thanks for the info.